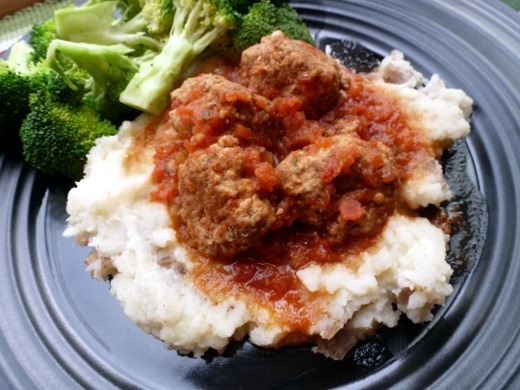 I can’t say it would have ever occurred to me to serve meatballs over mashed potatoes, but I can say that I think it works! This recipe for Barbecue Turkey Meatballs has mixed reviews on the Cooking Light website, but I was actually quite a big fan of this dish. I think the main issue with the recipe is that the title, which includes the word “barbecue,” really sets up the wrong expectations. The sauce, made of brown sugar, apple cider vinegar, cumin, paprika, and cloves, pureed with a can of diced tomatoes with green chilies, is really much more Southwest-inspired than barbecue. And I realize the idea of mixing Southwestern flavors with mashed potatoes is also somewhat bizarre, but I just really liked this dish, what can I say? Maybe it isn’t for everyone. Simple, smashed redskins are the perfect vehicle for delivering the remaining tomato sauce to your face. Who needs pasta when you’ve got potatoes!? Is this recipe for you? Are you tired of boring spaghetti and meatballs? Then possible yes. 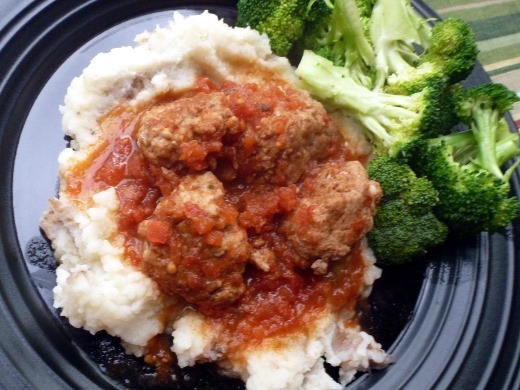 Also, if you like turkey meatballs, Southwestern tomato sauce, and mashed potatoes, I bet you might enjoy them mixed together. This is one I’ll make again! Place first 6 ingredients in a blender or food processor; blend until smooth. 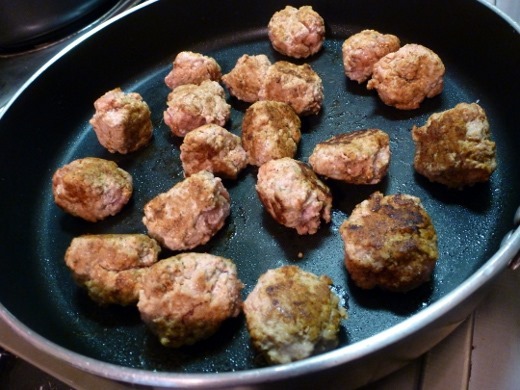 Combine turkey, breadcrumbs, and chili powder in a large bowl; using wet hands, shape into 16 meatballs. Heat a large skillet over medium-high heat. Lightly coat pan with cooking spray. Add meatballs; cook 2 minutes, turning to brown on all sides. Add tomato mixture to pan; bring to a simmer. Cover, reduce heat, and simmer for 6 minutes or until the meatballs are done. 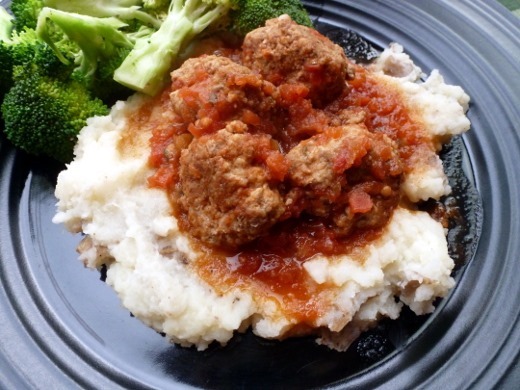 Serve meatballs and sauce over mashed potatoes (homemade are best!). Pingback: Dinner Meal Plan for November 17-23 | Meg.Goes.Nom.Nom. Pingback: Dinner Meal Plan for November 24-30 | Meg.Goes.Nom.Nom. 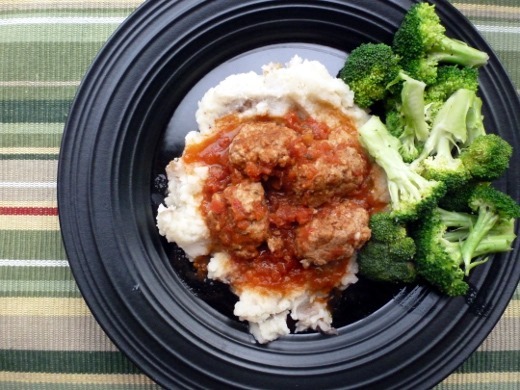 Pingback: Dinner Meal Plan for December 1-7 | Meg.Goes.Nom.Nom.